I’m one of the 9 Stones Artists in South Carlow. 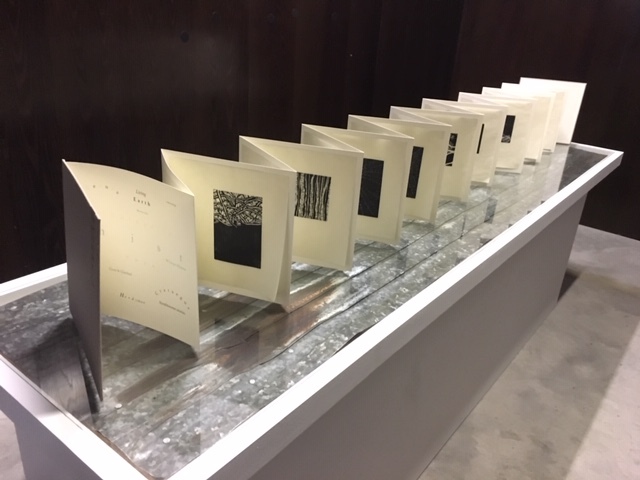 Here is news about our latest project – a very special handmade limited edition Artists Book, with woodcut prints from all the artists. It is presented as an installation and forms part of the new season of art at Visual Carlow. Opening tomorrow at 3pm, until 19 May. Special thanks to 9 Stone Artist Anthony Lyttle for teaching us the fascinating art of woodcut printing. Thanks also to artist bookmaker Ciara Healy for helping inspire us and in her work to create such a beautiful book and poem from the two words we all submitted. On display at Visual, Centre for Contemporary Art Carlow. Opening Sat 9 February 2019, at 3pm. Martin Lyttle, Jules Michael, Rachel Joynt, & Gwen Wilkinson. & Heritage at IT Carlow. 9 Stone Artist, Anthony Lyttle, uses woodcuts as an integral part of his practice. In sharing his specific knowledge through workshops, the 9 Stones Artists were introduced to a new skill and visual language. Would love to see you again.